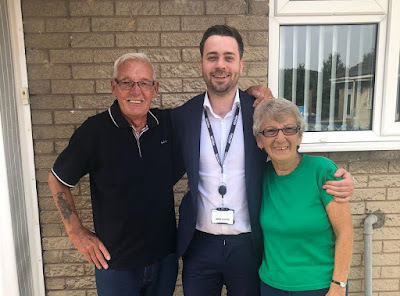 Robin Powner, a long-standing Origin Broadband customer from Doncaster, had a surprise visit from the firm's CEO Oliver Bryssau when he needed an engineer recently. When the company started in the ISP world over seven years ago, the two founders Oliver and Henri used to set-up customer routers in their homes. with rapid expansion across the UK in the last few years, this isn't possible anymore because of an increasing customer base. That's until Oliver heard about Robin, who was left without any internet after another company accidentally took over his connection. Mac, one of Origin's team leaders in the customer service department knew he needed to get Robin and his wife back online. This is when Oliver heard about the situation Robin was in and decided to bring back one of our old traditions. Oliver and Mac, armed with their tech knowledge and a bunch of flowers, went to Robin's home and got him back online in no time. Oliver Bryssau, CEO of Origin Broadband, said: "We pride ourselves on giving the best customer service. It's been great to get back on the road again and meet our customers. I'd like to thank Mr and Mrs Powner, for inviting us into their home. Origin has grown a lot over the last seven years, but our customers remain at the heart of everything we do." Launching in 2011, Origin has developed its own infrastructure and now host the sixth largest broadband network in the UK. Supplying phone and internet services to businesses and homes across the UK, clients include Amazon – where Origin is the preferred provider for all new warehouse and corporate sites, NHS Sheffield and various UK universities. The company's growth has attracted significant investment, allowing Origin to move its head office from two sites in Doncaster to a single, larger base in Rotherham. Taking on the 53,665 sq ft Unit 7 at Callflex Business Park at Manvers, the firm believes that it offers an even bigger opportunity for growth. The building, which had been empty ever since it was built, has the capacity to seat up to 700 people across all three floors. The Origin Broadband website has been down for a while, giving a "500 SSL Negotiation Failed" error.